Have you ever wondered why we blow out candles on our birthday? Or why we make a wish when we blow out the candles? Well, it seems the idea could have started with the Ancient Greeks who put a candle on a cake to make it shine like the moon to celebrate the goddess Artemis. It may have been the Germans who first used birthday candles for their children's Kinderfest. In, 1746 Count Ludwig von Zinzendorf celebrated his birthday with a "cake as large as any oven could be found to bake it and holes made in the cake according to the years of the person's age and every one having a candle stuck into it..."
However it started, putting candles on a birthday cake is a fun tradition and adding a candle to a birthday card is fun, too! I found a small bundle of vintage birthday candles when we were visiting Lauren. Fun, right? 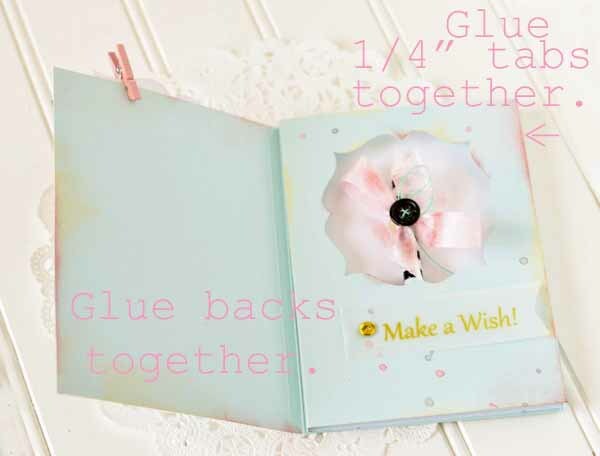 I tied a ribbon around one of them and hot glued the ribbon to the card. 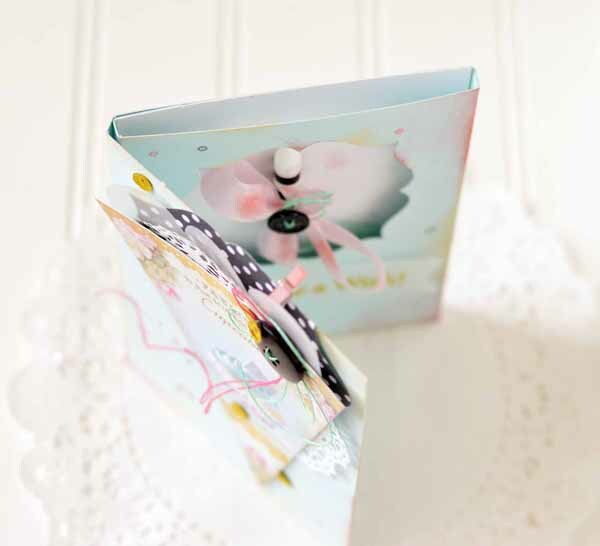 This darling image is from The Bunny Cloud. Puppy adorableness! 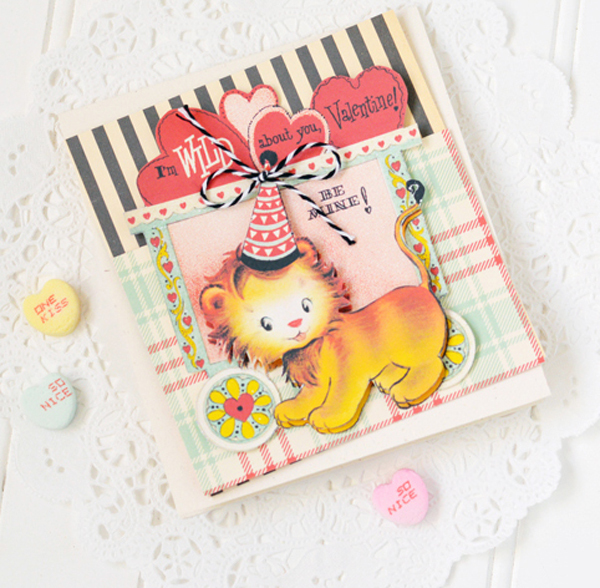 Here's another fun idea: Make an "Inside Surprise" card to show off a candle on the inside! Usually, we try not to mix kids and fire! But birthday candles are the exception. "Bigger" kids love them too! We may make a wish when we blow out candles because many ancient cultures believed that smoke helped carry their prayers to the heavens. 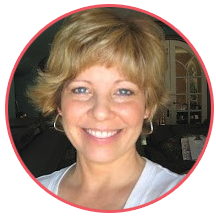 Do you like the pretty cupcake banner? It's part of a set from Cameo Shoppe on Etsy. 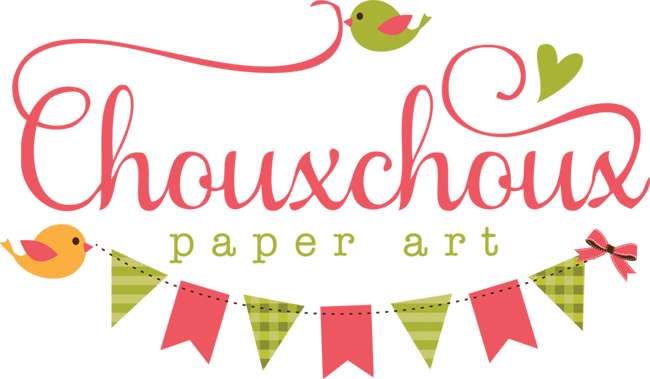 You need one piece of 8 1/2 x 11 cardstock. 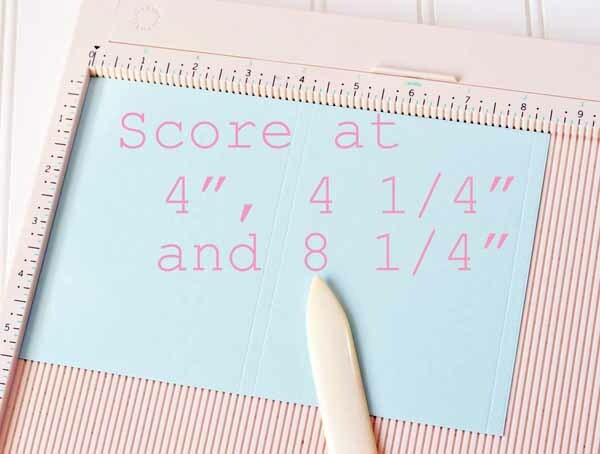 Cut it into 2 pieces: one that is 5 1/2 x 8 1/2" and one that is 5 1/2 x 5 1/4." The 5 1/2 x 5 1/4" will become the inside. 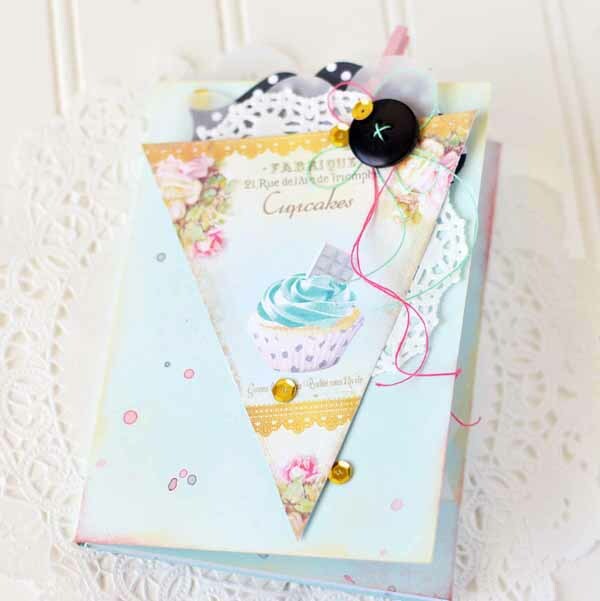 Use a die to create a window in the middle of the 4". 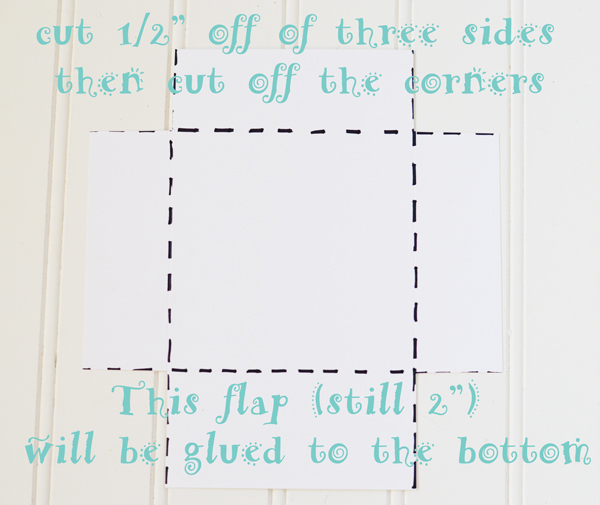 Add a 4" x 5 1/2" panel to the inside piece. I used hot glue again on the candle. Now attach the top to the "inside surprise." Embellish and you're done. 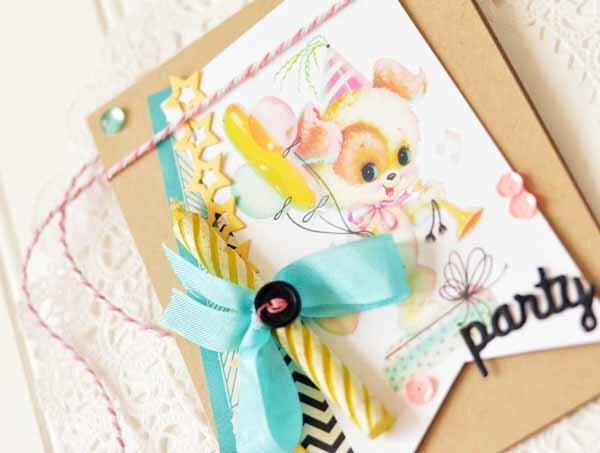 The next time you make a birthday card think about putting a candle on it! Jean called me early Friday morning and asked if I could meet her before we both headed off to work. I said "Of course" and wondered why she wanted to see me. It was so mysterious. Well...she gets out of her car with a box of heart shaped frosted donuts! Aren't they pretty? Almost too pretty to eat...ALMOST! I did share a few with people I work with and brought home a couple (one more for me and one for Dennis). 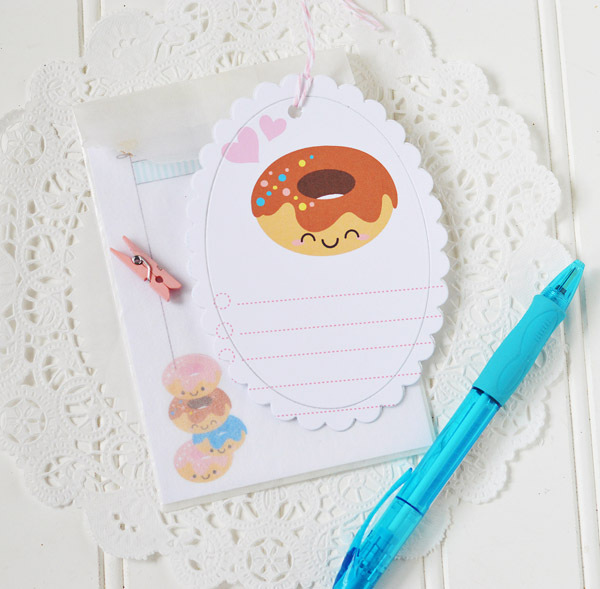 I found some darling stationery from Paper Glitter. 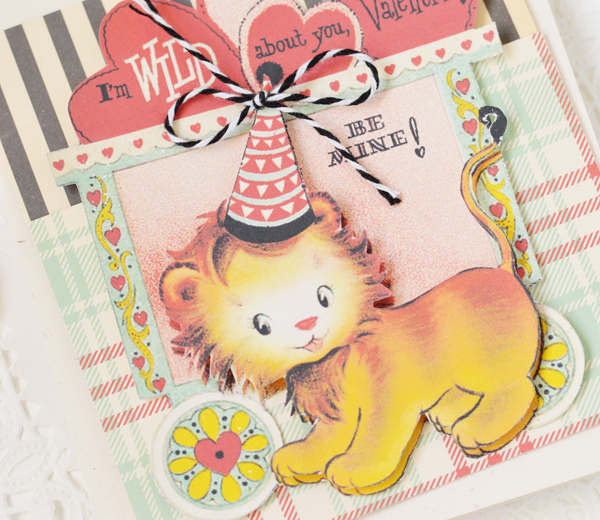 This is just a small portion of the complete set - it is ADORABLE! 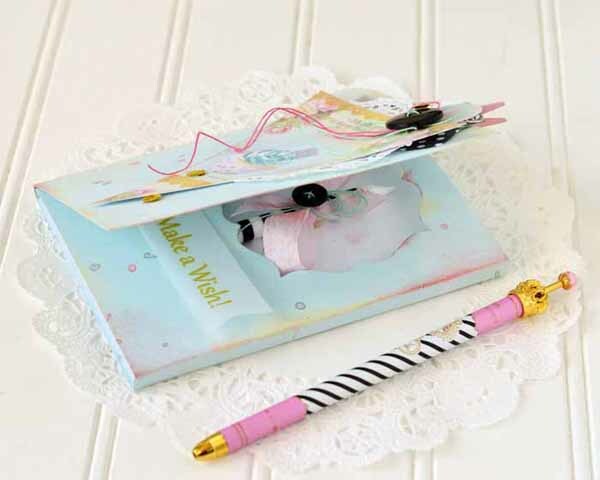 There are notecards, check off lists, labels, stickers, cards, envelopes... 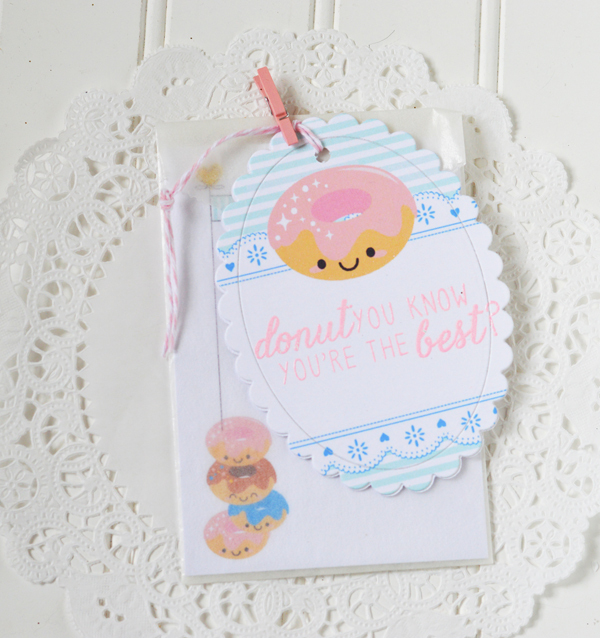 I used a card to create the oval tag. To keep the inside piece together with the scalloped frame, I kept the cut paper in the die, turned it over and taped the backside. 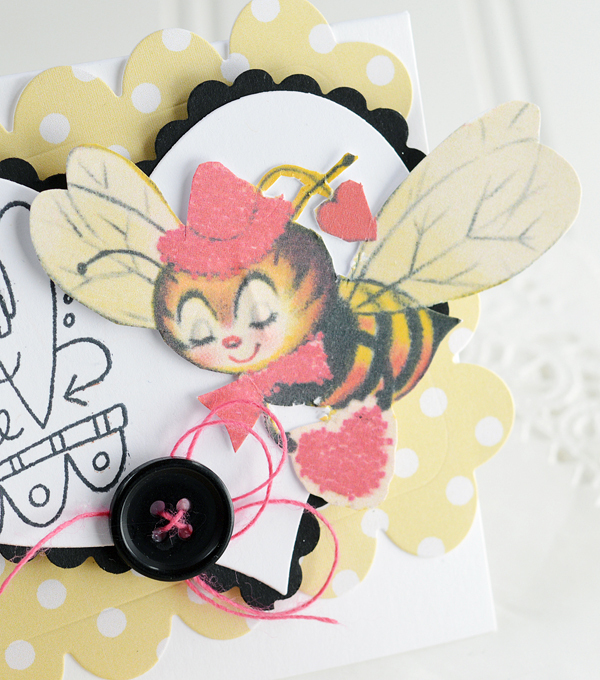 I did that with both the front of the tag and the back and then glued them together. The sentiment is part of a set from Reverse Confetti. 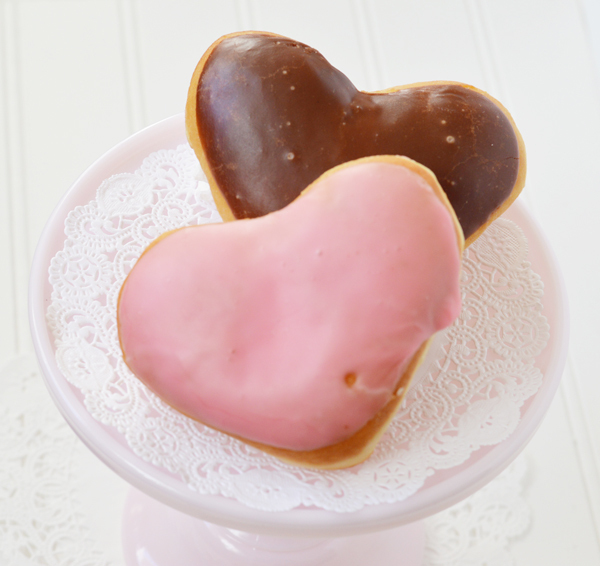 I LOVE LOVE LOVE donuts! I don't care if people say they're no good for me. I disagree - something that I so totally enjoy are perfect for me! 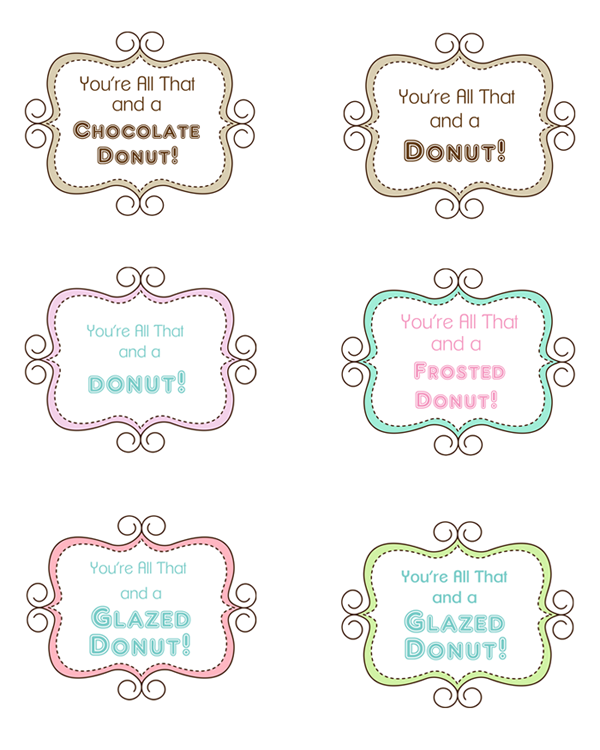 So when I say "You're All That and A Donut!" I'm saying a lot! 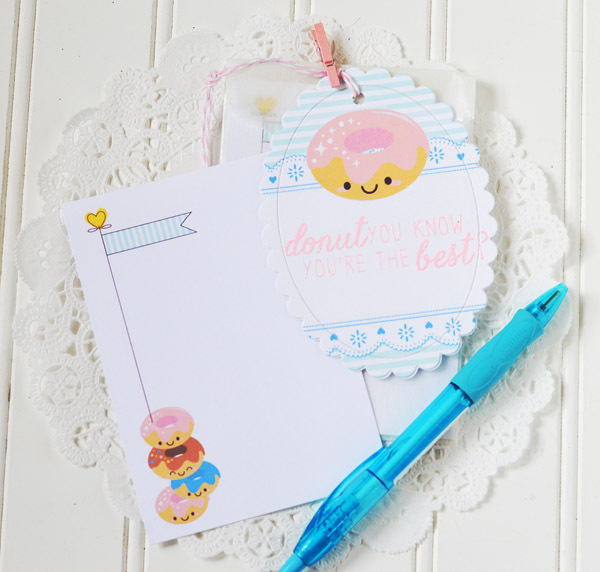 This sweet project can work for all kinds of things: a valentine, a birthday, father's day, friend's day, a thank you.... A donut is perfect for just about everything! Another cool thing about this is that it is fairly quick and easy. 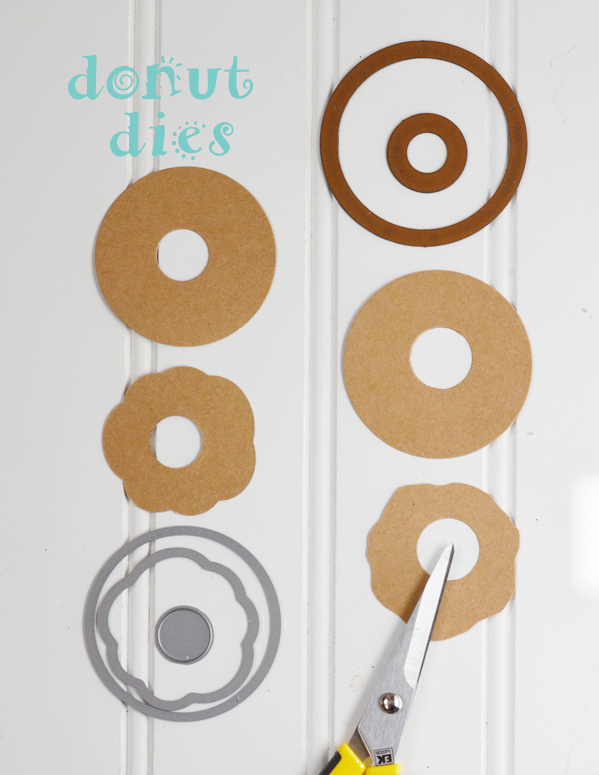 You can use special donut dies (like these from Reverse Confetti) or a circle die and handcut the icing. You can add just about any color glitter for the icing. 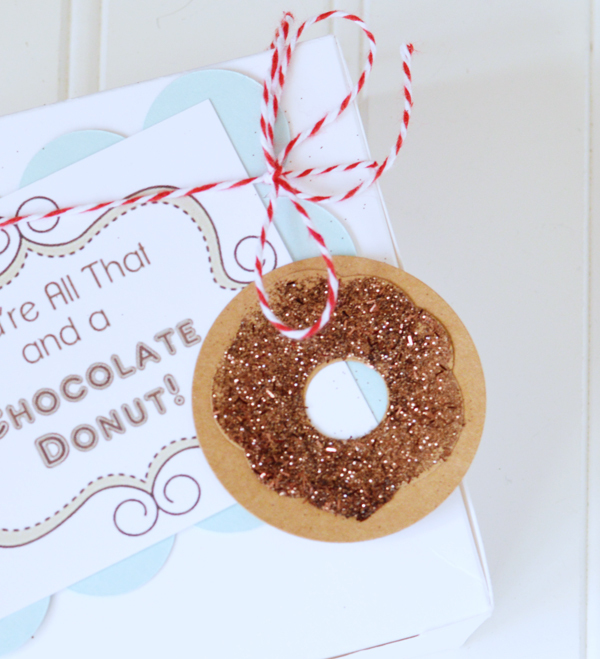 This is a combination of brown tinsel glitter and regular brown glitter. Cut two pieces of 110lb cardstock to 8 1/4" x 8 1/4". Score both pieces 2" from the edge on all four sides. 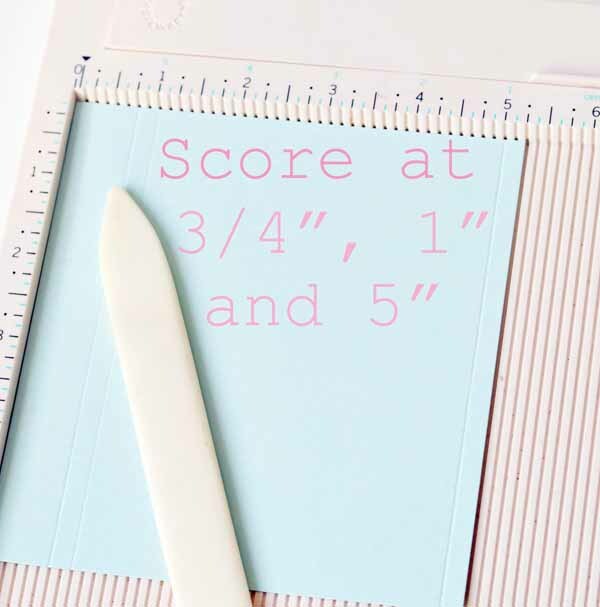 For the bottom of the box, using the photo above as a guide, also score four 1/2" tabs. 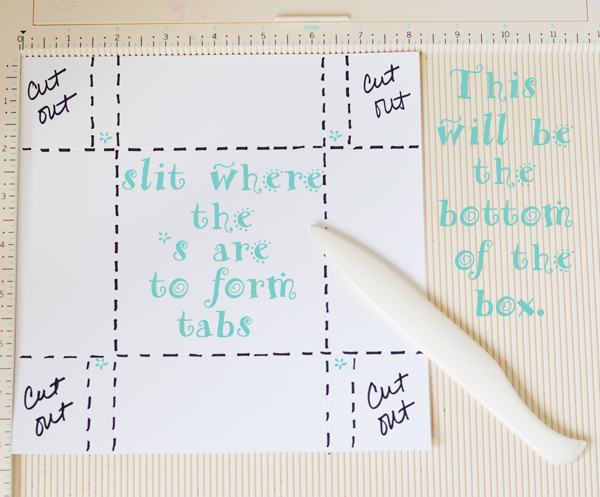 Then cut off the corners and slit the tabs. 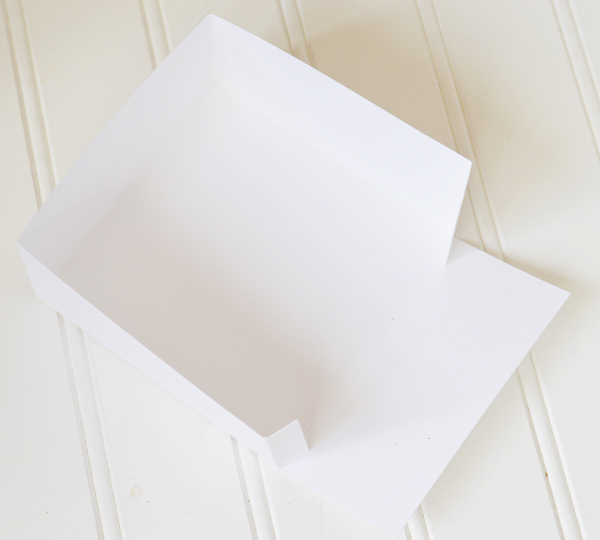 Fold up the box on the scores and glue tabs. Now, for the top. It's already been scored 2" on all sides. Follow directions in photo. One last step for the top: the sides need to be angled a bit so that the lid will tuck into the bottom. 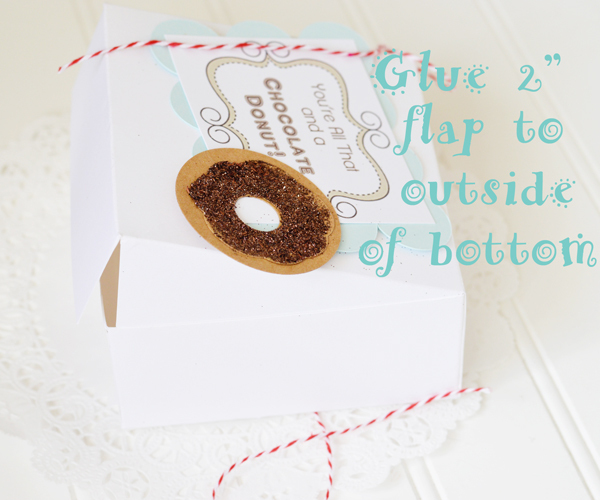 Glue the 2" flap to the back of the bottom and tuck the top into the bottom. Box is complete! 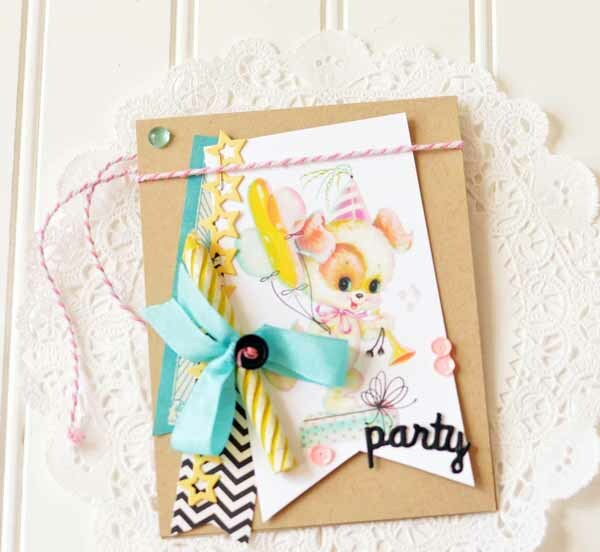 Add a cute tag - you can download these HERE. 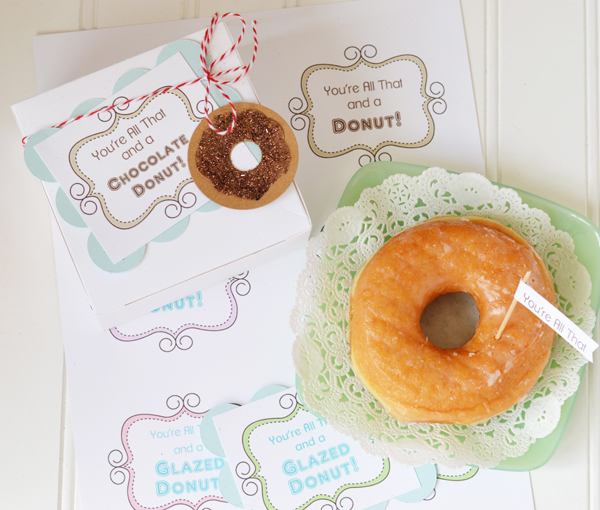 These cute frames are from Fudgy Brownies. You might want to make some different tags with these! 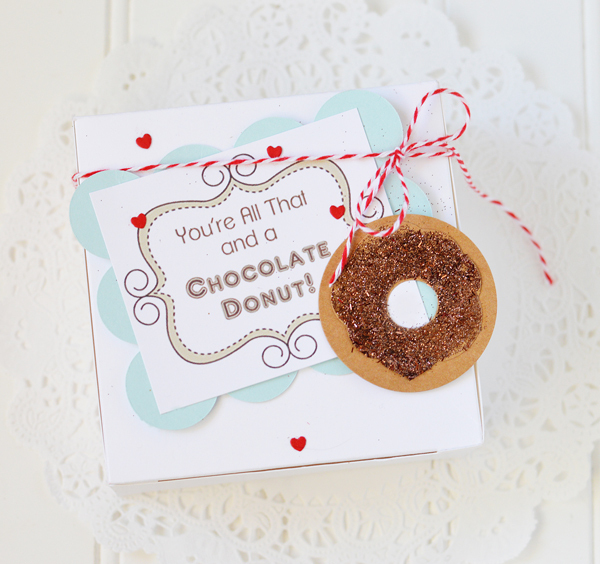 I added some tiny hearts (included in the donut dies above) to make this box for Valentines. I may have to give this to myself! I think things will slow down in a week or so. 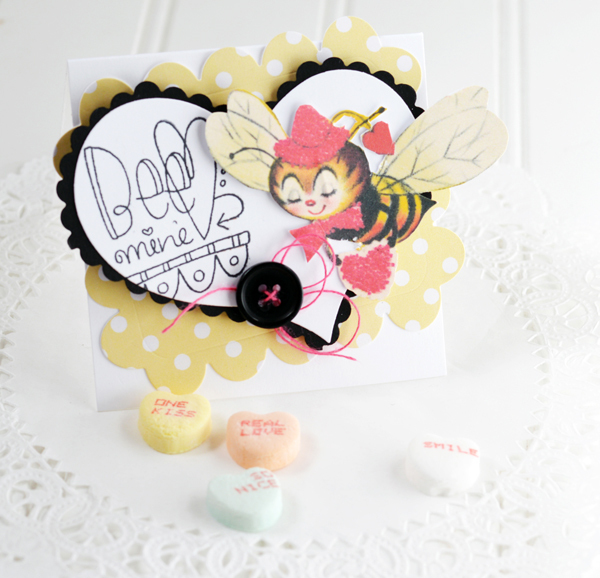 So busy at work and then making all the special order valentines at home! So nice that people want my creations, though - so I'm not complaining! I Ain't Lion this lion is adorable! You can download it HERE. Just right click and download.